Mulligan’s is an authorized club fitter for all major manufacturers. Each major manufacturer prefers outdoor club fitting and we take great pride in providing this service through our relationship with Bogey’s Sports Park. There is no comparison to real ball flight vs. simulated ball flight (hitting into a screen at a big box store). And outdoors we still offer computerized launch monitor services and shaft optimization. Not every golfer wears the same sized shoes – why should they use the same sized clubs? Our staff will help you choose clubs based on your individual skill level, swing type, physical ability and personal measurements. 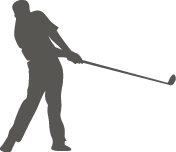 Our goal is to help you determine which manufacturer’s individual clubs best suit your game. An often overlooked aspect of game improvement is set makeup – how many wedges do you need? Our great selection of fitting carts from the major manufactures help us determine shaft type/flex, length, lie angle and grip type/size. Building the perfect custom set is a surefire way to improve your game and lower your score. This is the one and only cardinal rule of clubfitting: Never buy a set of clubs without hitting balls outside, in conditions that allow you to see the direction and trajectory. Indoors nets, coupled with launch monitors and other swing analyzers, are useful. However, golf is not played in a labratory. To gain a realistic sense of club performance, you need to take the measuring devices outsite.